Has a lack of interesting colorways turned you away from experimenting with the APL Vision Low? 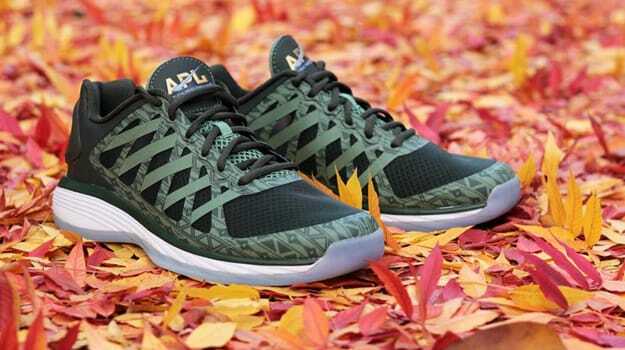 Well, you&apos;re in luck as APL has unveiled a new colorway featuring a graphic upper. Sure, they&apos;re banned in the NBA, but it&apos;s not like any of us are going pro anytime soon. The Vision Low "Soft Green" features a black FloZone upper with accents of green on top of a white and translucent grey outsole. With it&apos;s Load N&apos; Launch technology, the shoe actually makes you jump higher thanks to a mechanism that propels the wearer higher when compressed. Dropping soon, the Vision Low "Soft Green" is a great alternative for anyone underwhelmed by this season&apos;s holiday collections. Check out the APL Vision Low "Soft Green" in the gallery above and keep an eye out for them at APL in the coming days where they retail for $150.